Japan’s deep-sea drilling vessel Chikyu is anchored at Shimizu port, Shizuoka prefecture on September 11, 2013. A Japan-led team of seismologists set off Friday on a mission to drill deep beneath the seabed in a search for the origin of earthquakes. 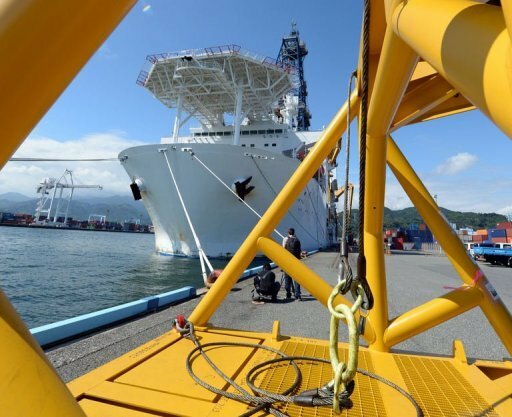 SHIMIZU, Japan (AFP) – (AFP) – A Japan-led team of seismologists set off Friday on a mission to drill deep beneath the seabed in a search for the origin of earthquakes. The scientists weighed anchor on Japan’s deep-sea drilling vessel Chikyu, heading for a spot in the ocean off the Kii peninsula, southwestern Japan, and a fracture in the Earth’s crust known as the Nankai Trough. Experts have warned the trough, which marks the place where the Philippine Sea plate slides under the Eurasian plate, is the likely source of a monster earthquake sometime in the near future. Japan’s government last year unveiled a worst-case scenario, warning a big quake in the area could kill more than 320,000 people, dwarfing the toll from the March 11, 2011, quake-tsunami disaster. In its four-month mission, the latest stage of a multi-year project that began in 2007, the team plans to drill 3,600 metres (2.2 miles) down and take samples from the crust. They will also be readying for another trip next year in which they hope to get 5,200 metres down, to the spot where the action actually happens. “It would be unprecedented to drill directly into a seismogenic zone, the area believed to release great energy and cause crusts to slide along fault lines and trigger tsunamis,” said Tamano Omata, a researcher for the Japan Agency for Marine-Earth Science and Technology (JAMSTEC). Scientists want to plant sensors — such as seismometers, deformation-measuring devices and thermometers — in the zone, which will form part of a system called Dense Oceanfloor Network System for Earthquakes and Tsunamis (DONET), which is linked directly to onshore monitors. “We expect to become able to monitor how the crusts move immediately before a quake hits,” Omata said. Shinichi Kuramoto, deputy director of JAMSTEC’s Center for Deep Earth Exploration, said recent research had shown mild earthquakes, in which the two crusts slip gently past each other, have occurred frequently over stretches of the Nankai Trough in the past five years. He said it was possible these were precursors to a mega-quake. “Directly drilling into and observing the place that may release a big quake would be a big step towards understanding the seismological mechanism,” he said. The 56,752-ton Chikyu — “Earth” in Japanese — has been anchored in central Shimizu port, and was open to foreign media this week ahead of the mission. The vessel, built in 2005 at a cost of $500 million, is equipped with a 121-metre (400-foot) drill tower that can descend 7,000 metres below the seabed, nearly three times as deep as its predecessors. It depends on satellite location systems with pinpoint accuracy that allow its captain to know exactly where the ship is in relation to the Earth’s crust. Seismically-active Japan experiences 20 percent of the world’s major earthquakes every year. Building standards are high and Japanese people are well-practised at taking cover when quakes strike, meaning damage and death tolls are often much lower than in other parts of the world. But its proximity to major tectonic faults means the risk is ever-present and developing a reliable quake alert system is the holy grail for seismologists. On March 11, 2011, the northeastern region was hit by a 9.0 magnitude quake, which triggered a huge tsunami. More than 18,000 people were killed when the waves swept ashore. They also swamped cooling systems at a nuclear plant in Fukushima, sending reactors into meltdown and sparking the world’s worst atomic accident in a generation. The heaving capital, Tokyo, is believed to be at risk of a devastating quake that could cripple Japan economically and politically. The last time a “big one” struck Tokyo was in 1923, when the magnitude-7.9 Great Kanto Earthquake claimed more than 100,000 lives, many of them in fires. Previously, in 1855, the Ansei Edo quake also devastated the city.